Large improvements on last week and one of the most dominant 1st halves of Bayern under Pep were not enough to overcome Simeone’s Atlético. After edging the first leg, the side from the Spanish capital held on against an excellent Bayern side who were on top for large periods. Following what was a weak performance in the first leg at the Calderon, Pep made a number of changes to his team as he looked to turn around the deficit. In his selection he made three changes to the starting lineup alone – Boateng came back into the defence after making his return on the weekend, Müller made the starting XI after being controversially left out for the first leg whilst Ribéry made a start on the left wing too. Alaba moved back into a left-back role with Boateng back in the team, Müller adopted much higher positions than Thiago had done in the first leg whilst Ribéry played in a more variable role than Costa had done on the left previously. One of the bigger changes from the Bayern dugout was seen in the orientation of the two full-backs. In the first leg between the two sides, Bernat and Lahm were generally positioned quite deep within the structure and were quite narrow in their respective half-spaces. With Bernat out of the starting lineup, Alaba moved into his left-back role though we saw a bigger change in the dynamics on the right flank. From the first leg, where both Bayern full-backs were rather deep. Lahm took on a wider role to begin the game. In a near-total contrast to his role in Madrid, Lahm adopted a much more ‘orthodox’ positioning at the start of the match as the German occupied more advanced spaces closer to the touchline. In doing so, he provided the width in the structure for large parts of the game whilst Douglas Costa instead possessed a more narrow-minded role as opposed to his wider role in the first game. On the left side of the shape, Alaba had a much more variable role throughout the game and shifted between the left wing and the left half-space. The Austrian is possibly the most complete player in football and his versatility on the pitch allowed him to act in multiple roles depending on the situation. On a more collective level, one of the most significant adaptions was in the attacking structure. In the first leg, Bayern were largely focused on breaking through the wider areas with Atlético maintaining control over the centre. Until Guardiola changed things in the second half, they had very little presence in the centre of the pitch and their attacking play was very limited. Both Vidal and Thiago were moving away from the 8 position to support development in wider areas as opposed to supporting the centre instead. Bayern benefited from better presence in the central areas. Guardiola understood that Bayern’s shape needed to have more balance when they hosted Atleti for the second leg and he adjusted his shape accordingly. Both Coman and Costa took on wide positions at the Calderon yet back in the Allianz they were both much narrower whilst their full-backs were now more inclined to provide the width. 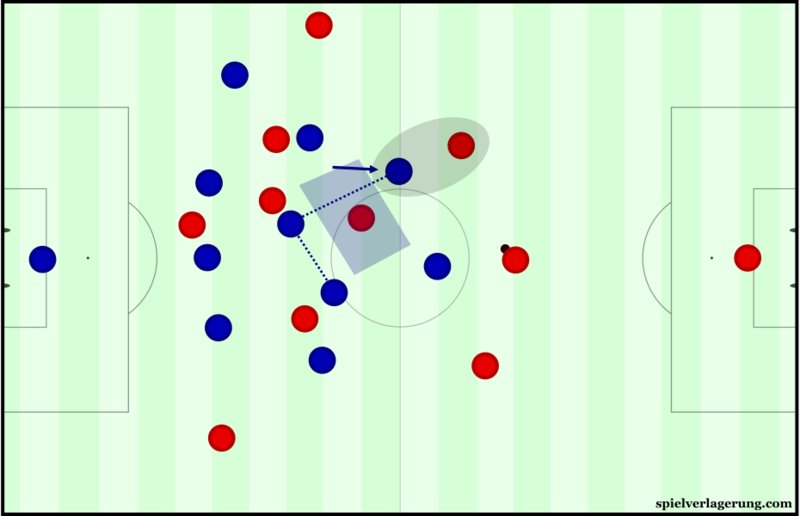 This immediately led to a structure with better occupation of the central areas within Atlético’s defensive block with three players all positioned in and around the 10 space. Vidal supported centrally from a deeper position too in their aim to have more numbers through the central areas of the pitch whilst Alonso became a more permanent figure in the defensive line. A comparison between the attacking structures of the first leg and the second. Although they didn’t have the same level of presence in deeper half-space positions from Lahm and Alaba, Bayern had a much greater occupation of the centre in higher positions and benefited from it as a result. They had much more pressure on the Atleti defensive block and were tempting the central passing lanes much more as Guardiola’s side were frequently trying to break the line of Gabi and Fernandez in the middle. Within this more centrally-focused attacking shape, another big change was the level of dynamic and variability within the movements of the players. As they were more focused on the wide areas in the first leg, Bayern’s attacking structure became rather repetitive with the midfield frequently repeating movements towards the wings to offer their support. However Pep’s side also improved in this regard and were much more flexible in possession of the ball against Atlético. Especially across the front 6, Bayern constantly changed shape with positional rotations and fluid movements from the midfielders. 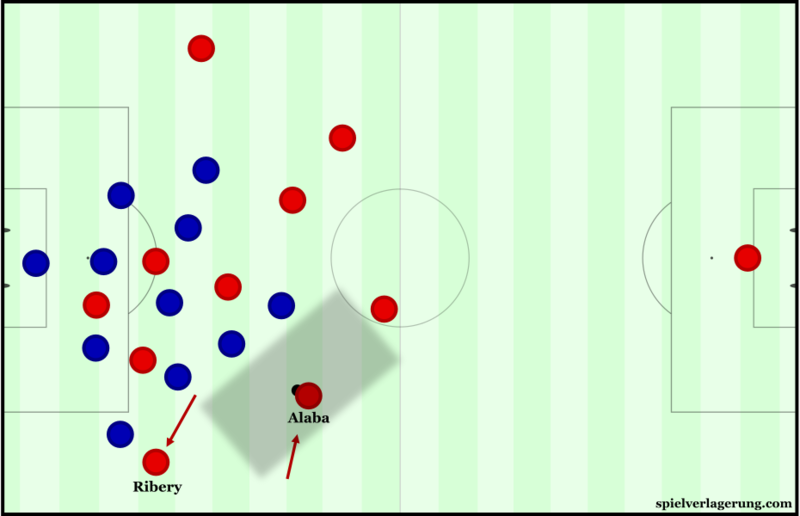 The central three of Ribery, Müller and Costa frequently swapped positions and adopted different spaces in an attempt to disorganise a compact Atlético defensive block. Perhaps the biggest example of the variability could be seen on the left side of the pitch, where Ribéry and Alaba constantly swapped responsibilities with width-providing and occupying the half-space. Although the structural difference was only very slightly different, the result of this rotation was quite large. As opposed to the French winger being positioned inside the Atlético defensive block Alaba had a greater presence on the outside of the shape, having more of an influence from an 8 position instead. Without the pressure of the oppositional defence, the Austrian could support Bayern’s ball circulation much better and help move the ball through midfield to create situations where they could break the oppositional lines of defence. From a position in the left half-space, Alaba could support the midfield circulation better. As a result of this great variability, Atlético found it more challenging to maintain a secure defence as they were constantly posed with different situations to deal with. With the Bayern forwards varying their positioning, it became very difficult for Simeone’s side to keep a track of the forwards and they became quite disoriented at times. Aside from the variability, the positional game of Bayern was better in numerous other ways too. The spatial occupation was a big improvement with often stronger connections through the midfield. Whereas the attack was largely disconnected in the first leg, the more tightly-knit group were more able to combine with each other back at the Allianz. Just as in the first leg, Simeone started his side in his usual 4-4-2(-0) formation. Diego Godín entered the fray, replacing Savic after the former had been absent through injury for the first meeting. Despite the presence of Torres and Griezmann close to the midfield 4, Atlético were struggling to cope with the improved Bayern positional play and their midfield was less stable against the narrower Bavarian attack. In reply to this change from Guardiola, ‘Cholo’ was quick to make his own adaptions and reverted to a 5-man midfield early in the first half. After around the 10th minute, Saul moved from right wing to the left central midfield position whilst Griezmann dropped to take a spot on the now-vacated right flank. Torres acted as a long striker whilst Fernandez dropped into the 6 space with Gabi in at right central midfield. Simeone’s intentions behind this change were to create a more secure midfield. The presence of an extra midfielder would’ve helped them create a more stable protection of the spaces Bayern were now trying to open and the Atlético manager was aware of this very early. When it came to achieving this goal, the midfield was relatively effective. Passing lanes were better covered now with the presence of an extra midfielder whilst they were more secure in defending wide areas, as they had three players (full-back, winger and ball-near central midfielder) who could shift over to diffuse any potential attacks from Bayern. Atlético’s situational 4-4-2 press from a 4-5-1 base shape. However as a result of this change, other areas of their game weakened. The biggest area by far was their pressing during the Bavarian build-up game. With Torres now on his own, Atleti’s ability to establish effective pressure on the opposition’s build-up was very weak and the Spanish striker was frequently overwhelmed by the build-up of Pep’s team. 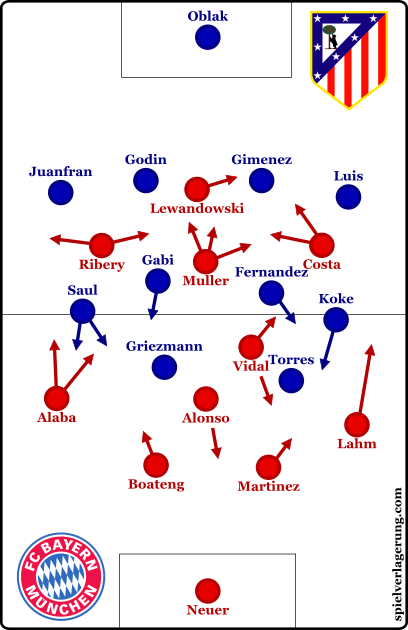 In an attempt to support him, Atlético made situational shifts to a 4-4-2 with the ball-near CM moving up alongside Torres to form pressure on the Bavarian first and second lines, however the timing of the movements weren’t always sufficient and Bayern could progress the ball effectively. As a result, Simeone decided to revert back into a 4-4-2 shape until half time, where he made a permanent change to a 4-5-1 as Carrasco came onto the pitch for Fernandez. The winger moved into a wide position on the left of the midfield whilst Griezmann once again dropped into the right. Saul became the defensive midfielder in place of Fernandez whilst Koke shifted inside to recreate the triangle with Gabi and Saul. Shortly after the sides re-emerged for the second half, Atlético broke the Bavarian counterpress in an excellent counter-attack which lead to the scores being levelled. With an all-important away goal, Simeone’s side could once again sit with a more defensive-minded block with Bayern now required to score twice more to progress into the final. Now looking to find two goals, Guardiola was tasked with supporting his side forwards as they had to again break through the best defence in the world. One adaption Guardiola made was in the re-structuring of the wide areas. In the first half, Lahm was much more orthodox in his movements whilst Alaba took on a more variable role closer to his respective half-space. This was almost reversed as the second half developed with Alaba moving towards the left touchline with increasing frequency whilst Lahm began to act as more of an extra midfielder. 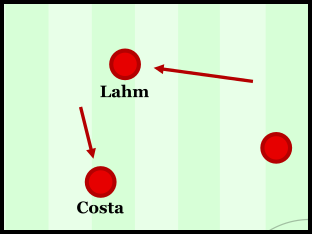 With the German captain now inside, the full-back could better support the midfield circulation as Alaba had done from the left, whilst he increased the possibility of Costa finding himself in isolation situations. In search of that vital goal, Bayern became much more focused on attacking through the wider areas of the pitch, similarly to how they had done in the previous leg. The positional structure was now oriented more towards creating overloads in wider areas from which crosses could be made into the box. This focus on creating from the wider areas of the pitch bore fruit quite quickly, with Lewandowksi converting an Alaba cross after Vidal knocked the ball down in the 6 yard box. Despite getting a goal back, Bayern were unable to find the winner as Atlético held on impressively. Whilst Simeone’s team were extremely stable in the quarter final match against Barcelona, their stability was not seen at similar levels in the semi-finals. Quite often relying on poor finishing from Bayern and some heroics by Oblak, the Spanish side rode their luck on a number of occasions. They controlled the first half of the match at the Calderon, which was in many ways a result of Bayern’s poor possession game, whilst they were dominated for large spells of the second leg. Expected goals is a strong barometer of performances and in every model, Bayern were shown to be the superior team over the two legs. Despite dominating the majority of the second leg they were unable to convert chances and ultimately, Pep’s Bavarian tenure will be wrongly deemed a failure by many.